This article was is from National Geographic News 16th January 2004. When the normally placid waters of Alaska's Chatham Straight begin to bubble in a violent boil, marine biologist Fred Sharpe slips up to the cauldron's edge for a front row seat. He knows a coordinated feeding frenzy of epic proportions has just begun. The bubbles are blown by a humpback whale (Megaptera novaeangliae) circling about 45 feet (14 meters) below the ocean surface as several of the whale's mates scream and wave their pectoral flippers in an effort to ensnare herring (Clupea pallasi) in the net of bubbles. Moments later, in a highly-coordinated act, the whole pod will lunge to the surface through the center of the net with their jaws agape in hopes of a meal. Sharpe, founder of the Seattle, Washington-based Alaska Whale Foundation, and his colleagues have been studying this feeding behavior for 18 years as part of a broad effort to conserve the humpbacks, an endangered species. The researchers have employed sonar imaging, genetic analysis, computer simulations, and a host of laboratory experiments in their quest to understand the behavior, but until they attached cameras to 16 of the humpbacks, they had never witnessed the spectacle from an underwater perspective. "You can do all the experiments you want, but to actually see one of those sardines engulfed by a whale is spectacular - and informative," said Sharpe. The footage, which adds insight to Sharpe and his colleagues' years of research, airs Saturday on the National Geographic Channel special Crittercam: Humpback Whales. Among the key insights provided by the footage is a better understanding of the whale's feeding habits and requirements, said John Calambokidis, a biologist and co-founder of Olympia, Washington-based Cascadia Research, a group that studies marine mammals. "Because some of the greatest threats to humpbacks would be their food supply, it is valuable to understand what they feed on and what conditions are required for them to effectively capture their prey," he said. Full-grown humpback whales can weigh more than 88,000 pounds (40,000 kilograms) and reach up to 50 feet (15 meters) long. Their mouths gape 15 feet (5 meters) across, but they can only fit prey the size of a human fist down their narrow esophagus. Most commonly, humpbacks are solitary diners, eating a diet of krill - a shrimp-like crustacean - and plankton, which they filter through hundreds of sieve-like plates called a baleen. The whales in Chatham Straight, however, eat herring, which are larger and much harder to catch. Sharpe said it is not clear why these humpbacks have developed a taste for herring, but "they have a high fidelity for that prey and they stay on it all season long." 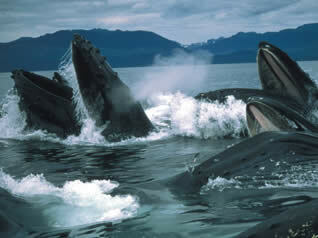 The humpbacks spend the winter months breeding in waters near Hawaii and return each summer to feed in southeast Alaska. Like most whales, humpbacks were hunted up until the mid-1960s for their oil, meat, and bone. Today, just 10,000 remain in the north Atlantic and even fewer in the north Pacific. The population Sharpe studies in southeast Alaska numbers no more than 1,000. Calambokidis said humpback recovery looks strong, but threats such as boat traffic, entanglement in fishing gear, sonar noise, and disruption of habitat and food supply remain. "Long-term, the greatest threat is probably to their prey base as a result of climate and environmental change," he said. For the humpbacks in Chatham Straight to succeed in catching herring, they work together, carefully coordinating their maneuvers to herd the fish into bubble nets. The herring won't cross the wall of bubbles. "Herring spend their whole life in a school and are used to a normal, rhythmic beat of the tails of their school mates. Bubbles represent a threatening, chaotic, domain," said Sharpe. Trapped in the bubble net, Sharpe and his colleagues had assumed the herring were an easy target, filling the humpbacks up for their 2,500-mile (4,000-kilometer) journey to Hawaii in the fall. But the Crittercam footage yielded a few surprises. "The whales are really not eating as much as we had anticipated," said Sharpe. "We know sometimes it's a total bonanza, but it doesn't look like a slaughter is going on." In fact, the herring routinely escape attack by the whales. They maintain personal space even when inside the bubble net, making them more elusive targets. They can also swim faster than the whales and some are quick enough to dive to safety if the whales' timing is off. "The biggest hero in all this is the herring," said Sharpe. Since one of the greatest future threats to humpback whales could be a dwindling food supply, understanding what it takes for them to get a meal may allow for better management of their food supply. This is particularly important as the humpback whale recovery continues, said Sharpe. Humpbacks tend to re-colonize former parts of their range. Many of their former haunts are now heavily populated by humans, such as the Puget Sound in the Pacific Northwest. Increased knowledge about the whales and their feeding requirements will allow for effective management of human behavior in terms of fishing quotas, shipping lanes, and even whale watching tours, said Sharpe.